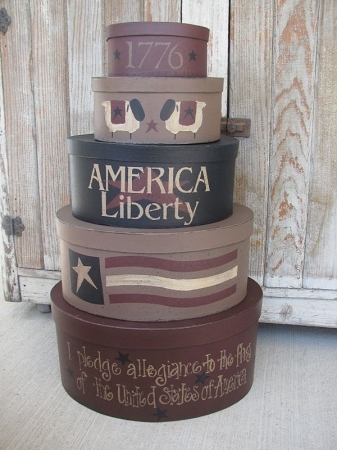 Primitive Pledge of Allegiance Oval Stacking Boxes Set of 5 . New DESIGN! Just created this design for these stacking boxes for the upcoming July issue of the Country Sampler magazine. I am so pleased with how they turned out. The colors in this set are so rich and warm and add a great primitive colonial color story for the Americana decor. The bottom box has part of the pledge hand wrote by me surrounded by stars. I pledge allegiance to the flag of the United States of America. The image in the Country Sampler magazine has a typo in it, this is the version you will receive. My deepest apologies for painting that incorrectly. Next a way flag, a star with America and Liberty stenciled over top, two sheep that I've hand painted, quilts on their backs with stars and last but not least 1776 at the top!. Size is 25 1/2" x 11" x 14". Oval Shaped set of 5. Hand painted and signed at the time of your order by Heidi.